My oldest son is in middle school. He earns an allowance and is always trying out his entrepreneurial skills. What my son and his friends seem to have in common is that they want . . . everything! He's eager to learn about money management because he views it as a means to an end. So my suggestion to you is focusing on teaching middle school kids the concepts that will naturally engage them, because they're meaningful right now. Further, most middle school teachers who take the time to teach financial literacy are often taking time away from a tested subject area. Very few of these teachers are lucky enough to teach a full semester of personal finance. So pragmatically speaking, identify and focus on the topics that you have time to teach and that are relevant to your students. Following are some lesson ideas and resources that you will find helpful. Developed for middle school and high school students, Gen i Revolution is an online game that gives your students the chance to learn important personal finance skills as they play and compete against fellow classmates. The program includes lessons, materials and additional resources for teachers. The game includes fifteen missions in which students attempt to help people in financial trouble. Students join the Gen i Revolution, strategically select their operatives, and begin to explore and earn points as they work to complete each mission. What I like most about Gen i Revolution is the opportunity to pair students up and teach them to collaborate and think critically to solve the mission problems. Eventually, many of our students will be working with a spouse to manage their money, a collaborative effort that is a skill in itself. So when the opportunity presents itself, I also like to put my high school students in a position to make joint financial decisions. And you can do the same in middle school. Hands on Banking is a comprehensive program with modules and curriculum for students of all ages. 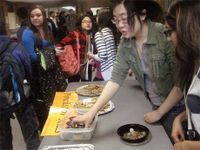 As I will mention in this blog series' post about high school, this program is also an excellent option for ESL students. However, I particularly like Hands on Banking for Teens as a middle school option. The program comes with an array of comprehensive instructional resources. If you don't already have one, set up an automatic savings plan. Authorize an automatic deposit into a savings account from every paycheck. Create a list of things you'd like to buy or achieve (a special item, a trip, etc.) in the next three months, the next six months and a year from now. What can you to do accomplish these goals? What are the costs of each goal? Research online savings accounts or see what special deals your bank offers for saving. Visa and the National Football League teamed up to create a game that helps teach financial concepts. Financial Football is a fast-paced, interactive game that engages students while teaching them money management skills. Teams compete by answering financial questions to earn yardage and score touchdowns. And yes, the game is accompanied with lesson plans for teachers. There are two approaches to using this tool that I believe work well. One approach is as a reward. If students finish an assignment early, they can play individually or partner up and compete with a friend. Another approach is to hold a tournament. The additional K-12 resources and national financial literacy standards that I originally mentioned in my 2011 post Financial Literacy for High School Students are still very good. I have also collected hundreds of resources in my LiveBinder and provided detailed information about my 30 favorite financial education games in a 2013 post by fellow blogger Andrew Miller. What resources are you using in the middle school classroom to teach financial literacy?